In 2007 several huge spinel crystals were discovered at Ipanko, near the town of Mahenge, in Tanzania. The largest of these, a 52 kg pyramid-shaped stone, displayed the vibrant orangey pinkish-red color that is considered to be top for spinel. Though the final yield of gemmy material from this rough was only a few percent, the stone yielded several thousand carats of valuable gems. The rough was faceted in Bangkok and AJS Gems was lucky enough to acquire some of the best of this rare material. One of the very finest pieces cut from this material is the 10.14 ct trillion pictured above. This is simply a fantastic gemstone, with top color and quality. 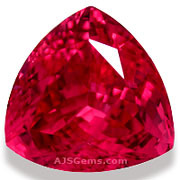 This gem has the electric neon fire characteristic of the best Mahenge spinel. The color is a vibrant pinkish-red that bursts with fire from all angles. It has been superbly cut into a gorgeous trillion shape. The clarity is outstanding as well, and we have graded this gem "almost loupe clean." See the video of this remarkable gemstone below. 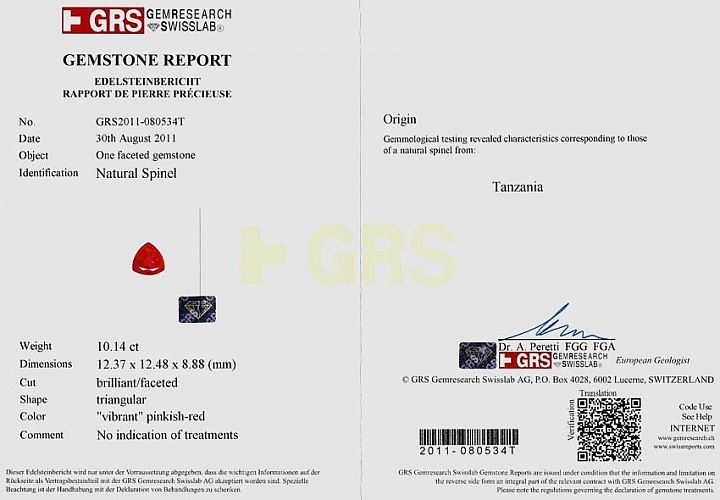 This exceptional gem is completely natural and untreated, and certified by GemResearch Swisslab (GRS), with the color noted as "vibrant" pinkish-red. This spinel was sold to a private collector in January 2013.